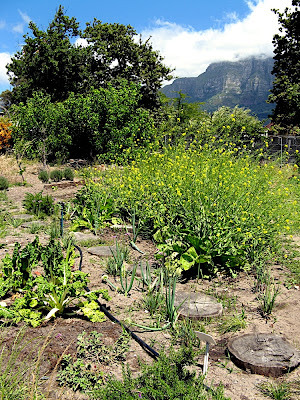 The Ariston Elemental Organic Gardening Project is a private gardening project on the go in Claremont. What was vacant, basically barren land near Claremont train station has been leased from the municipality by passionate organic gardener Brigid Jackson and is gradually being turned into an oasis of green. The garden grows enough organic vegetables to supply surrounding homes, and a series of garden talks educate participants on various aspects of elemental organic gardening. You are also able to buy worm tea, natural compost and seedlings from the garden's informal nursery. Ariston Elemental Organic Garden is a surprising green oasis in the middle of Claremont’s busy CBD. The garden’s creator and caretaker is Brigid Jackson, who leased the land from the municipality some time back, and has been coaxing it into abundance. If you haven’t yet seen the garden (usually viewable by appointment only), next weekend might be the time to do so. On Saturday the 25th of September, in celebration of Spring’s arrival, the garden will be hosting a Spring Market Day. Brigid will be selling a variety of organic plants, seedlings, vegetables, flowers and more, and I’m certain one can also have a bit of a wander around the grounds. It’s wonderful to see what can be achieved in an urban environment – and it’s definitely worth a visit! Ariston Garden is located at the corners of Dunluce and Malone Avenues, Claremont. The Spring Market Day will take place from 10am to 2.30pm on Saturday 25 September 2010.